I met my friend Kevin in the late 80s. Among his many talents, he creates Knotwork designs. Kevin typically creates very complex, free form knots and then tools them into leather for his garb for the Society of Creative Anarchisms (SCA) of which he is a part. Unlike the typical border work of a more standard, symmetrical knot, Kevin’s style is to create broad sweeps and then tiny inter-weavings to populate a design or free form shape. Creating knots of one, two and three strands, depending on the use of the knot and can become very complex because you are not using any formulas or pre-made patterns. I had asked him to design a cross for me and he smiled. “I will design this knot and teach you how it is done so long as we call the amulet: “Joy”, for my friend” he told me. He had not seen her in years yet wanted to dedicate the design to her. He drew it in one sitting: smiling the entire time. 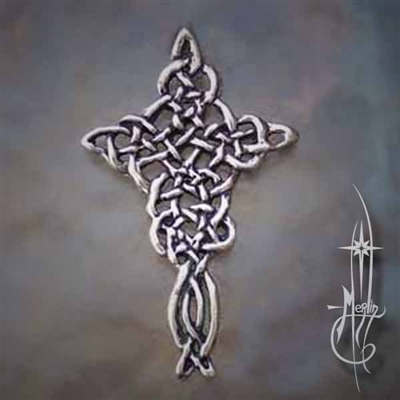 It is an eternal knot: one strand from beginning to end forming the cross with the circle of spirit in the center: the “Empty Cross” (He is Risen) design. Though Catholic: “she won’t mind” he told me; “Think of it as a compromise.” Kevin isn’t Christian! And so I present to you a cross dedicated to friendship and Joy. Yes, and they presented the cross to me on one of my visits from Detroit to Va. I was so happy with this gift that I remember shedding tears of…well you can guess the rest. It is so nice to read the background of the creation of my cross…it just makes it so much more special. I think of my “Family” all the time up here in the frozen north. I love you all so much and am grateful for your love and friendship.